Extreme weather events are a current area of focus within the scientific and environmental community, and the wider public. And for good reasons. Damaging, and costly, weather events are becoming more extreme as a result of climate change and are increasingly affecting communities, both rich and poor, across the globe. A recent study from the Norwegian Meteorological Institute, in cooperation with the European Academies Science Advisory Council (EASAC), Extreme Weather Events in Europe: preparing for climate change adaptation focuses on the current status of such events affecting Europe. This is an update to a study in 2013 by the EASAC, with more recent data and reports affecting several critical drivers of extreme weather events, and the implications for heat and cold, precipitation, storms, winds and surges, and droughts. There is also an addendum to the 2013 report, Statement from EASAC, that explores more recent evidence of two phenomenon: the jet stream; and, the Atlantic Meridional Overturning Circulation (AMOC), which is critical for maintaining mild weather in Ireland and northwest Europe. The analyses are of European-wide data and trends and further assessment is needed to apply these trends to local or regional conditions, and the adaptation strategies necessary to counter such impacts. Yet the more localized assessments are in large part predicated on the latest information from these larger, wider studies. Winter rainfall has decreased over Southern Europe and increased over Northern Europe, with rainfall more frequent than over the past 70 years, and that trend will continue. In part as a result of the precipitation patterns, drier conditions will prevail across Southern and Central Europe, as will longer dry spells and loss of soil moisture. Droughts will increase throughout Europe, while at the same time there will be more flash floods from local intense precipitation. These conditions will lower river flows with increased stress on water resources, which will impact agriculture and other commercial activities, as well as drinking water sources. Heat waves will become more frequent, longer and more intense, while cold spells and frost days will decrease, especially across Southern Europe and Eastern Mediterranean areas. Floods have risen across Europe, and will continue to rise, consistent with increases in the frequency and intensity of heavy rainfall predicted. However, at this point the authors are not able to link increased flooding to climate change for a variety of reasons. There is a lack of solid data, with problems from inconsistent reporting across countries and unreliability of data in some developing countries. It is difficult to get agreement across many countries of what constitutes “severity” of a flood. There are a variety of mechanisms, besides precipitation, that can influence flooding, including: snow-melt; failures or collapses of ice-jams, landslides, dam and dikes; and, discharges from glacial lakes. There are also socio-economic issues including deforestation, land use change, especially urbanization, and reduction of wetlands for development. Finally, and somewhat ironically, assessing current floods is complicated by the adaptation measures that have eliminated or minimised flooding in specific places. Yet flooding remains particularly destructive with substantial economic costs, including repairs or replacement of infrastructure (e.g., bridges, roads, railroads). 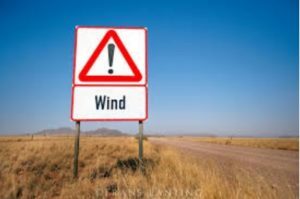 Windstorms are projected to continue to increase, especially over Northwestern Europe. However, they will also impact continental Europe where they may be less frequent, but where there is a concentration of economic value that raises the losses. In total, these storms are responsible for more than half of economic losses caused by natural disasters, a loss comparable to earthquakes, floods and hurricanes in the USA and Japan. Generally speaking the most severe impacts from climate change will be experienced in Southern and Mediterranean Europe, especially around coastal zones, along rivers and other water bodies, and islands. Recent work has also begun to more clearly define the economic costs of these extreme weather events. Insurance companies’ data sets and analyses indicate that the frequency of weather-related events with losses has increased significantly at a global level, while losses from geophysical hazards (e.g., earthquakes or tsunamis) have increased only slightly. About 91% of loss events are from extreme weather and 75% of these are from storms and floods. The total insurance losses from extreme weather events has reached €415 billion since 1980, of which storms and floods cost €300 billion. In Europe, the weather-related increase in losses has been 60% since the 1980s. In addition to economic losses, these weather events have cost an estimated 140,000 lives since 1980, especially from heat waves. Heat waves are deadly, and storms and floods are costly. 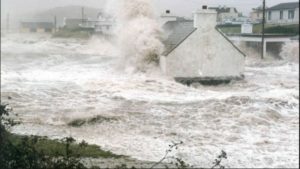 For example, the 2003 heat wave that hit Europe resulted in 70,000 deaths, with economic losses of €12,300 million (of which 18 million was insured), whereas the August 2002 floods and severe storms that hit parts of western and central Europe resulted in 30 deaths with €16,800 million in economic losses (of which €3,500 million was insured). Table 4.4 (Norwegian study cite). The import of these assessments is how they determine what climate adaptation strategies countries adopt. Within the European context, the responsibilities for climate adaptation necessarily will fall on individual Member States, with support from the EU. Furthermore, within Member States much of the work on adaptation will be the responsibility of regional and local authorities, and individual economic sectors such as agriculture, transport and energy systems. However, some impacts will have a cross-border dimension where EU involvement in developing and implementing adaptation strategies likely will be more extensive. Finally, there is an addendum Statement from EASAC that explores more recent evidence of the Atlantic Meridional Overturning Circulation (AMOC) and the jet stream. 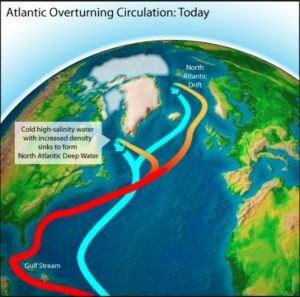 The AMOC is a system of currents in the Atlantic Ocean that carry warm salty water from the Tropics and Southern Hemisphere to the North Atlantic where the heat is transferred to the atmosphere. The system also includes a southward flow of deeper, colder fresh water that is part of the thermohaline circulation. The AMOC is what gives Ireland and northwest Europe its mild climate. With climate change, and specifically warmer and increased precipitation that can inhibit the formation of the deep, colder branch of the AMOC, it was recognized that there existed the possibility that the AMOC could weaken and affect the temperatures in northwest Europe. That possibility has been realized, although the rate and scope of the weakening is open to dispute. More disturbing is the growing sense that the AMOC could actually switch off entirely instead of just declining, with devastating results for Europe’s weather, possibly cooling Greenland, Iceland, UK and Scandinavia by 9°C. Another threat is an amplified Arctic warming with a possible shift in the jet stream which could lead to colder winters in middle latitudes. While past research had indicated little direct evidence of such a shift, more recent data and analyses suggest that such a risk should gather more attention. These larger, geographically dispersed, studies not only set the stage for the regional and local studies of adaptation measures, they also may provide critical data and analysis for establishing the evidence needed for legal claims in climate change litigation. As the AMOC recent Statement notes, increased sophistication of computer models and access to computing resources are allowing researchers to attribute the contribution of climate change to specific weather events. 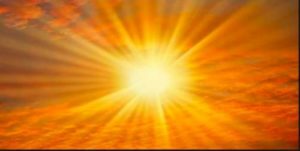 It cites studies of heat waves in Australia, China and Europe where climate change is concluded to have increased the probability of such events. To the extent that governments and businesses, such as fossil fuel companies, have the capability to foresee extreme events, they may be held by courts to share liability for the damages that result from those events.